Help us save species and protect habitats. Support our appeals. From once in a lifetime opportunity to do something amazing for conservation, to urgent requests for donations to save a threatened species or protect a habitat, you can help Nature Kenya achieve positive change for nature and people. Find out about our efforts to save species and protect sites and habitats. You'll be amazed by the range of campaigns and appeals you can get involved in. The Taita Apalis (Apalis fuscigularis) is one of the rarest birds in the world. It lives only in the forest fragments at the tops of the Taita Hills in southeastern Kenya. The Taita Apalis is considered Critically Endangered in the IUCN Red List because it has a tiny occupied range of 500 hectares. It's montane forest habitat has become severely fragmented and continues to decline in both extent and quality. The very small population of the Taita Apalis has consequently been fragmented into extremely small sub-populations. Recent surveys suggest that the species has experienced a severe population decline and may consist of only 100-150 individuals. The future of the Taita Apalis depends on how quickly the current habitat can be restored, expanded and protected. Actions include land purchase or lease, active restoration of degraded areas and engaging local people in protecting this unique species. The Taita Apalis belongs to the bird family Cisticolidae, related to the warblers. Some taxonomists consider it to be a subspecies of the Bar-throated ApalisApalis thoracica, and write its name as Apalis thoracica fuscigularis. However, the Taita Apalis looks completely different from most races of the Bar-throated Apalis. It is a small warbler-like bird of forest edge and undergrowth. Sooty-grey upperparts, with darker wings and tail. Black throat and breast. White to off-white belly and vent. Silvery-white eyes. Voice Males and females often duet, males leading with a rhythmic tchep-tchep-tchep and females follow with a softer titititit…..Habitat: Forest patches in Taita Hills, Kenya. The Taita Apalis is now restricted to a small number of forest fragments in the Dabida and Mbololo massifs, Taita Hills, Kenya. A survey in 2001 estimated a population of about 300 to 650 mature individuals.However, recent surveys conducted by Luca Borghesio, Lawrence Wagura and Mwangi Githiru suggest that a severe decline has recently taken place, and that the population may now number only 150 individuals. Nature Kenya has leased Msidunyi forest, a 6.28 ha private forest fragment located on the western side of Vuria peak of the Taita Hills. 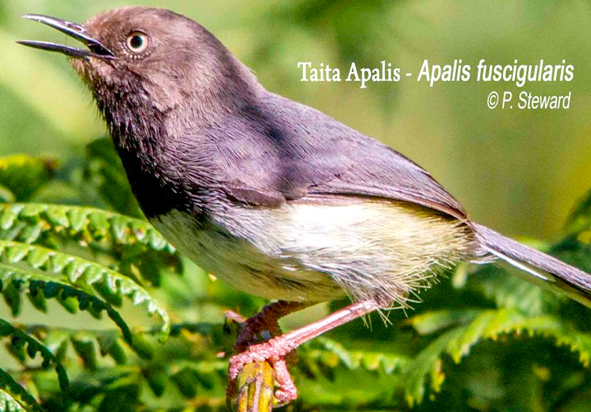 This small forest fragment will secure 6% of the world’s Taita Apalis population. Funding for the lease was secured from African Bird Club, the World Land Trust and other donors. In addition, Nature Kenya, working with local communities, plans to restore 115 ha of degraded Vuria Community Forest,which is contiguous to Msidunyi and is held in trust for the local people by the Taita-Taveta County Government. Further, Nature Kenya is looking for more private land to buy or lease to secure the Taita Apalis habitat for perpetual survival. Please donate to allow Nature Kenya to: buy or lease land; restore degraded habitats and empower local people. The future of the TaitaApalisis in your hands! Cheque - Payable to Nature Kenya and post to P. O Box 44486-00100 Nairobi, Kenya. With the demise of vultures comes a problem on an economic and social scale as yet uncalculated and certainly unrealized. Vultures provide a vital ecological service benefitting humankind immeasurably. They are nature's scavengers - clearing up carcasses and waste that would otherwise rot and spread disease. Ironic perhaps, that a family of birds associated with death in so many cultures is now caught up in their own fatal metaphor. In response to the mounting threat, BirdLife Partners have joined forces across Africa to take swift and coordinated action for its eleven vulture species. There's a great deal to be done, in limited time, while the chance to make a difference remains - and we need your help. We need your support to stem the threats to African vultures!